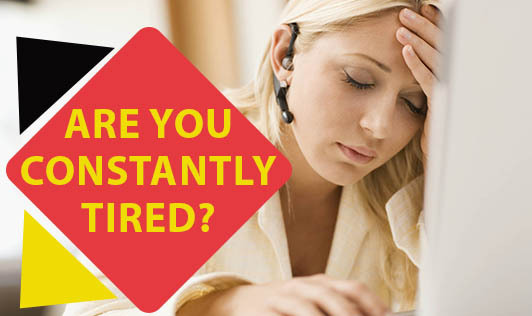 There could be many reasons for you to experience fatigue or tiredness constantly. Here are some causes for feeling tired almost all the time. Make sure you contact your physician to rule out any health problem for your unending fatigue. 1. You are not eating enough and therefore lack energy or you are eating adequately but not the right foods that give you sustaining energy. 2. You are not getting adequate sleep or your sleep is not of good quality or you suffer from sleep apnea. 3. You are anemic. If you are a woman and experience heavy menstrual bleeding, you are at risk for anemia. 5. Your thyroid gland is underactive. 7. You have an underlying infection. 8. Your blood glucose is uncontrolled or your diabetes is undetected. 9. You are changing your work shift frequently and this might be affecting your sleep pattern. 10. You are over-exercising but not eating enough to make up for the lost calories. 11. You are on a crash diet for quick weight loss. 13. You are very stressed. There are many other reasons for prolonged fatigue. It's best to consult your doctor to find out what applies to you and how to overcome the tired feeling.